Metastatic pancreatic adenocarcinoma is considered a uniformly fatal disease with a median survival of 1 year with modern chemotherapy. While a subset of patients achieve prolonged survival, few of the factors that define this group of patients are known. For the determination of overall survival (OS), 549 patients with histologically confirmed metastatic pancreatic adenocarcinoma were evaluated. Emphasis was placed on treatment history and family history of breast, ovarian, and pancreatic cancers. To ensure a uniform metastatic population, patients treated with prior locoregional therapies (i.e., surgery or radiotherapy) were excluded as were patients with a prior history of stage I–III disease. Patients with family history or pedigree history of cancer had superior OS. This was especially true in patients with three or more relatives with either breast, ovarian, or pancreatic cancers [hazard ratio (HR) 0.49, 95 % confidence interval (CI) 0.30–0.80, p = 0.003]. First-line platinum chemotherapy was associated with a poor survival (hazard ratio for death 1.74, 95 % CI 1.12–2.71, p = 0.01) for patients without a family history of these cancers but not for those without such a history (p = 0.31). In fact, as the number of relatives with these cancers increased, the OS survival improved for individuals receiving first-line platinum therapy (HR 0.76, 95 % CI 0.65–0.89, p = 0.0004), which was not the case for those receiving other therapies (p = 0.98). 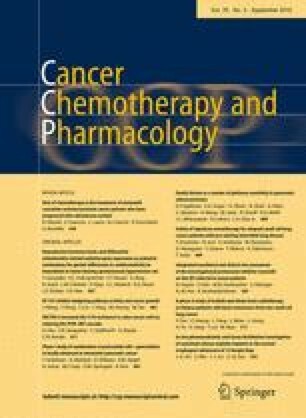 Treatment with platinum chemotherapy in patients with a family history of breast, ovarian, or pancreatic cancers was associated with a longer survival, whereas platinum use in patients without such a family history of cancer was associated with poor survival. These findings suggest that family history may serve as a predictive marker for platinum use in patients with metastatic pancreatic adenocarcinoma. David Fogelman, Elizabeth A. Sugar, and George Oliver have contributed equally to this manuscript. Dr. Diaz is a founder and shareholder of Papgene Inc. and Personal Genome Diagnostics and licensed technology to these and other entities. These relationships are managed by the Johns Hopkins conflict of interest committee. These items disclosed by Dr. Diaz are not related to contents of this article. Dr. Klein notes that under a licensing agreement between Myriad Genetics Inc. and the Johns Hopkins University, Drs. Klein is entitled to a share of royalty received by the University on sales of products. The terms of this arrangement are being managed by The Johns Hopkins University in accordance with its conflict of interest policies. Other co-authors declare no conflict of interest with the contents of this article.